"With Fitbit you can track your steps, sleep and much more by simply remembering to carry one small unit with you." "Kickstart your workout routine with ease." One of the hardest things I have done in my life to date was trying to get back into shape; I have tried to change nearly my entire lifestyle to become much healthier. I don’t know about you, but for me, finding motivation to get back into a normal exercise routine and eat healthier was something I would always think to do. I would usually try for a week or two and then fall back into the same old rut of not following through. When looking around for various ways to try to kick start my health and get myself more active I began hunting a pedometer – something to raise my awareness around how much I walked (or didn’t for that matter). While there are plenty of options -- many ranging widely in price from as low as $10 to others that are up and over $100 -- one that continued to stand out in reviews and advertisements was the Fitbit Ultra Activity/Sleep Tracker. So, like anyone else who is intrigued and looking to try something out, I went out and purchased one. Could a little companion that you clip on your belt really kick start a healthier lifestyle and make things change for the better long term? Let’s hit the break and take a look at how this small object made such a huge impact in my fitness success this month. After immediately unboxing the unit as soon as I got home I was a little disappointed to find out that I had to sync it to a computer in order to get started. Included in the box is a USB connected dock into which the Fitbit slides. Then, you are required to download their software, which is a rather small file that is required for set up. Once you install the software and plug your Fitbit into the computer you are required to set up an account. It asks for personal information like height and weight (don’t lie about it because that helps track your progress). Once you walk through all of this the unit will display a unique code on which you need to enter into the computer and then it will sync your Fitbit unit to your created account. 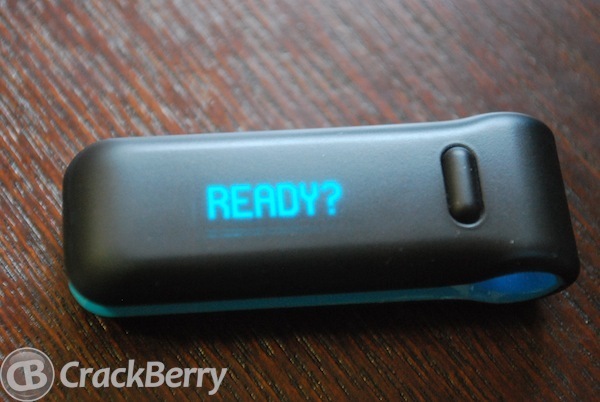 After creating your account and completing the setting up, your Fitbit unit it is ready to go. Time to strap it to your hip or toss it in your pocket and get going, right? Well, you will want to charge it up for a little bit before you begin. Fear not, however, because a single charge will easily get you through nearly two (yes two) weeks of use. As far as where to place the Fitbit, it is recommended to have it on your hip, in your pocket or, for the ladies, you can actually clip it right on your bra if you desire. The unit itself is rather small and extremely light which is great because you hardly realize that it is there. Included in the packaging is also a belt clip. If you happen to wear a thick belt, or fear that it will break while attempting to get the unit over it, you can simply slide it into the clip and then clip the whole piece to yourself. Once it was all set up and I figured out the best way to carry it with me, it was time to get up and test it out. When first looking into the Fitbit I was a bit skeptical as to why I was paying $99 for a beefed up pedometer with a few extra features. Since so many people had such positive things to say, I knew it had to be a good investment. The first few days will be used to set your baseline, this will give you an idea of how many steps you are taking, how active you are during the day, how many calories are burned, floors ascended etc. Once you have a baseline, setting the challenge begins -- like breaking the previous day’s record in one way or another. The Fitbit has one button on it and pressing it will flip you through the options that are available such as showing the time, your step count, distance traveled, calories burned, levels climbed and a few others that can be added as well. While strapped to you the unit will automatically count your steps, and judging by your height, it can help you determine the distance in which you have traveled that particular day. And while you (like me) may be skeptical about the calculations, the folks at Fitbit have said that the counter is 95–98 % accurate. The counter continues to monitor your activity throughout the day and will display your current totals. It is also possible to start an activity during the day which not only will count towards your daily goals, but will allow you to track that specific time frame separately. To begin an activity all you have to do is simply press and hold the button on the unit for a few seconds and then it will blink and a timer will start. When you check your stats during this time frame it will only show you the stats since it began. If you want to see how many steps you take while shopping, taking a jog or anything else in similar nature you are able to do so easily. With each passing day you will likely find yourself continually checking your stats, trying to beat the previous day and walk further, climb higher or burn more calories. Beyond tracking your physical activity the Fitbit will also track your sleep patterns, since rest is equally as important as the physical activity itself. This is the one part of the Fitbit that I found to be the hardest to comprehend, how could a pedometer also monitor my sleep pattern? How would it know how long it took me to fall asleep? How did it know I woke up at 2AM and again at 4:47AM? Well, tracking your sleep is extremely easy, much like operating any other aspect of the Fitbit unit. Included in the packaging is an adjustable wrist band that is made out of a very comfortable fabric. There is a small slit which half of the Fitbit slides into and it sits just like that while you sleep. When you get into bed you press and hold the button, starting the timer. From here you do nothing, just relax, do whatever you do before you sleep, and then sleep your night away. When you wake up you press and hold the button again to end the activity, and that is it; just like that, you tracked your night’s sleep. Once synced to your computer you will be able to view all of your sleeping results, included in the breakdown is how many times you woke up, how many hours you slept and how effective your sleep was (based on wake up count). In addition to this there is also a chart that shows how many times and at what time you were active during your sleep, whether it be waking up, tossing and turning or getting out of bed to grab a drink. Beyond simply tracking your data and keeping it stored in one easy to access place for you, the Fitbit has a few other neat features as well. 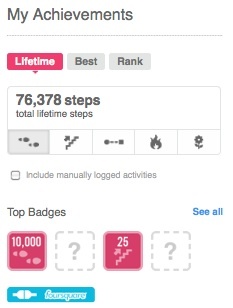 If viewing your step count is not enough to keep your motivation up, how about some badges to unlock? In similar fashion to foursquare, Fitbit has included some badges that can be unlocked for reaching various achievements; some of them are for things like walking your first 50 miles or climbing 10 levels in one day and plenty of others as well. Trying to unlock new badges keeps you pushing a bit further and ultimately, that is the goal -- to continue pushing yourself harder to do better. While the Fitbit is a standalone unit, there are a bunch of API’s available for developers so they can tie their application into use with the Fitbit. If you are tracking your food with an application like MyFitnessPal, or tracking your runs with Endomondo, you can tie your Fitbit account right into those accounts with just a few simple clicks. Fitness is always better when you are able to share the stats with your friends and challenge them to beat you. You are able to do all of this with ease right from the Fitbit site. Syncing your information to your account is extremely simple and luckily not something that you need to do every day. The unit itself will hold your data back for days, so, if you are not able to reach a PC to sync the data that day, don’t worry it won’t be lost. As long as your computer is powered on and connected to the internet with a dock connected to it, the Fitbit will wireless transfer your data from the unit to your account anytime you are within 15 feet of the base station and relatively motionless. If you want to sit down and sync it, all you have to do is place it on the dock and press the button. Check the site after you hit the button and your information will appear nearly instantly. Whether you want to easily track your daily activity, or you are looking for a way to kick start your physical activity, the Fitbit is a great choice that allows you to easily do just that. As with any other aspect of getting in shape, this will take dedication. You will need to remember to bring it with you daily and you will need to strap it on your wrist before heading to bed. Tracking the data is only the beginning, it is completely up to you how you react to this data; you can decide to challenge yourself and take it to the next level, or you can remain content with what you are doing and not try to better yourself. 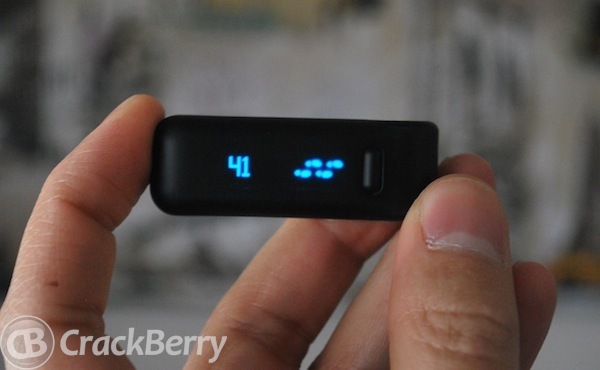 Tracking your steps, sleep, calories and more is extremely easy. You are not required to remember to do anything daily except to carry the unit with you. 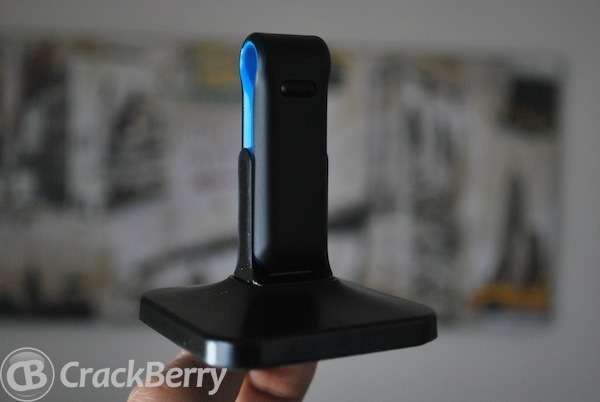 Unfortunately there is no BlackBerry application currently available, and the unit does not tether. After weeks of use the novelty wears off a little, unless you push yourself harder.